What’s wrong with calling a burglar brave? Why are people so f***ing hung up about swearing? Why do the asterisks in that sentence make it okay? Why do so many people want to stop other people doing things, and how can they be stopped from stopping them? Why is every film and TV programme a sequel or a remake? Why are we so reliant on perpetual diversion that someone has created chocolate toothpaste? Is there anything to be done about the Internet? 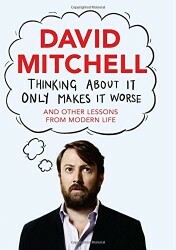 These and many other questions trouble David Mitchell as he delights us with a tour of the absurdities of modern life – from Ryanair to Downton Abbey, sports day to smoking, nuclear weapons to phone etiquette, UKIP to hotdogs made of cats. Funny, provocative and shot through with refreshing amounts of common sense, Thinking About It Only Makes It Worse celebrates and commiserates on the state of things in our not entirely glorious nation.